NCUK's International Foundation Year gives you the choice of access to a wide range of universities and degree courses. The NCUK IFY is a modular programme that will prepare you for first-year entry to undergraduate degree courses. You will study a combination of modules that fit in with your degree destination. The programme is made up of 3 core modules and 1 elective module. The overall aim of this course is to provide an introduction to the basic economic concepts and principles. Reference is mainly to the UK experience in preparation for studying with British students at university. The first semester will deal with 'micro' economic issues and the second semester will deal with 'macro' economic issues. The overall aim is to ensure that students have a solid grounding in many aspects of business studies and feel confident in commencing the study of business-related courses at undergraduate level. Operations management is not included. 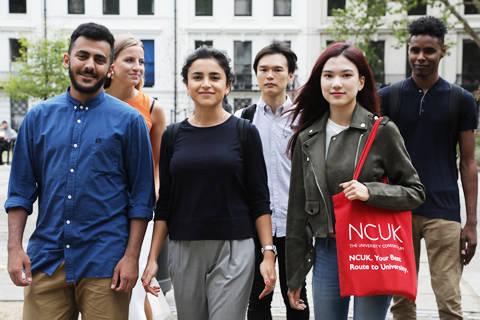 All NCUK programmes include a specialist English for Academic Purposes module designed to give you the language ability and study skills that will give you a head start on your undergraduate degree in the UK. All NCUK modules are integrated into the EAP module. This means that subject coursework will be used by the EAP teacher to introduce and practise specific academic language skills required for these subjects. The overall aim of this course is to equip students with the mathematical knowledge and skills necessary for entry to the first year of any UK / Western undergraduate degree course. The overall aim of this module is to ensure that students have a solid grounding in many aspects of the study of society and politics and feel confident in undertaking undergraduate studies in this field. The module is based mainly on sociology, and more specifically on 'A' and 'AS' level Sociology specifications approved by QCA. The final summative assessment is made up of 30% continuous assessment (coursework) and 70% final examination(s). 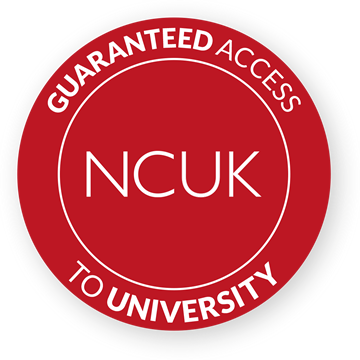 Part of the NCUK guarantee is that students are guaranteed a minimum of 2 conditional offers to the universities and 1 unconditional offer if you pass the course. To ensure you are fully supported as you step towards studying for a UK university degree, we offer a range of student placement services. Our Student Placement Co-ordinator will provide you with practical advice and support on study options available at a wide range of UK universities. We have a course directory of around 4000 degree programmes across the 16 universities in the NCUK portfolio. More than just Business degrees. Our graduates can progress to a wide range of different degree programmes including Architecture, Law, Psychology, Computer Science and English Literature. Late application deadlines for NCUK candidates. NCUK students are guaranteed a place at one of the 16 NCUK universities listed below. 100% of BSC London Hampstead candidates have passed the programme. 100% of BSC London Hampstead candidates have received Russell Group university offers. 85% of NCUK graduates go on to achieve a minimum of second class honours in their undergraduate study. BSC London Hampstead has been teaching English programmes for over 40 years. We are one of the most highly accredited English training centres in the UK with 12 British Council overall strengths and EAQUALS recognition. All of the staff are fully qualified and are experts in their field. All students receive weekly one-toone counselling with a member of the Academic Management team. Personalised assistance to the university application process. Our team are always accessible to students. BSC's highest-scoring graduate will be invited to an awards ceremony and will receive a monetary prize. Exclusive scholarships available to NCUK graduates from the universities. Spend a year in the UK's thriving capital. A quieter and more residential area of London – great for focusing on study. Easy travel around the UK to visit university campuses.